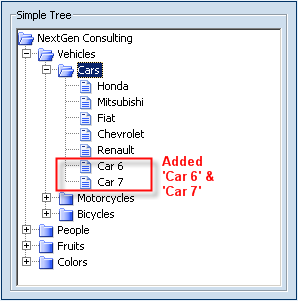 Smart Client Tree control extends SWING’s JTree base functionality and provides visual presentation to hierarchical data. 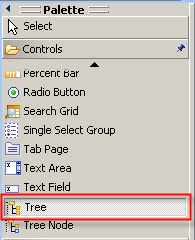 Tree control displays hierarchical data as an outline. 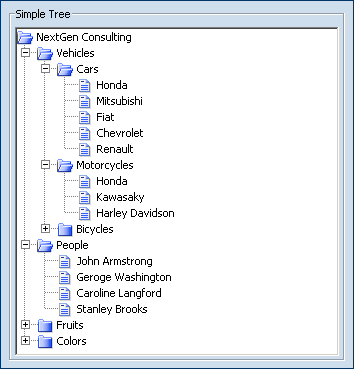 Changes in the tree bound hierarchical data model are automatically reflected in the tree. A tree is constructed from nodes that can be identified by a tree path. 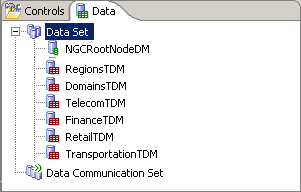 Each node is optionally bound with a data model that contains the business data associated with the node. A colon (:) separated list of nodes from the tree root node. The tree path is used to uniquely identify a tree node. Is described by a Static Template. A list of child templates. 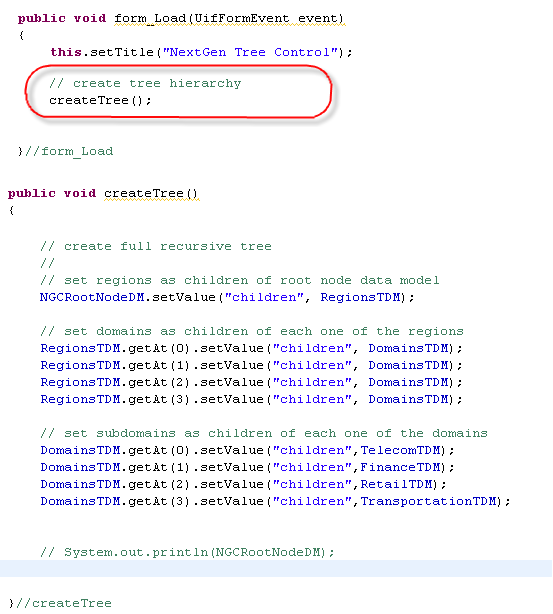 The tree has a hierarchy of tree node templates starting from the root template which defines the tree hierarchy meta structure. 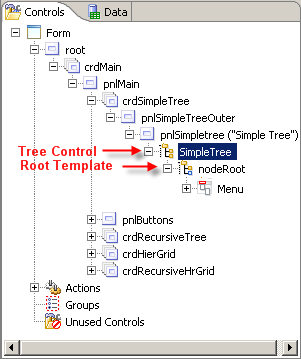 Templates are used for defining different node characteristics in a tree (Case, CR, etc). Its associated node has a fixed presence under its parent node, For example, nodes which serve as heading nodes are static nodes. If a static template has only static ancestor templates, it considered as pure static and has a fixed presence in the tree. A stub (place holder) template which refers to another non recursive template. 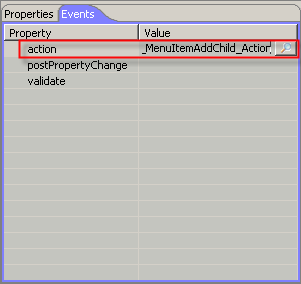 At runtime the place holder is replaced with a proxy to the referenced template. 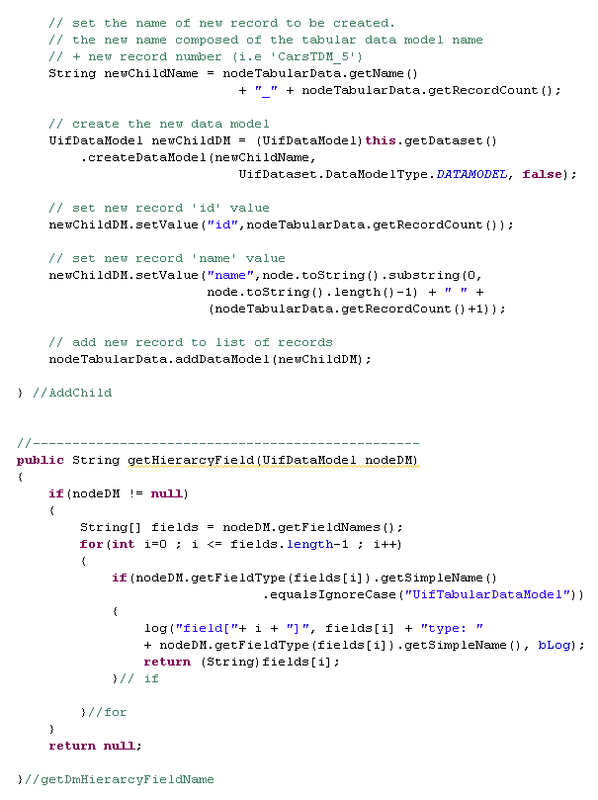 Recursive templates are used for models that have a recursive pattern e.g. organization hierarchy. The outer most parents for all the tree nodes. The root node has a mapping to an underline form hierarchical data model root. Each tree has a single root node. Leaf node is defined as node that is not eligible to have children. Container node is eligible to have children but does not necessarily have ones. 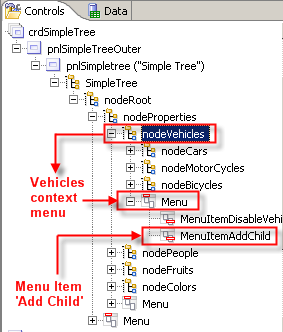 In order to display the child nodes for a specific container node, the container node should be expanded by clicking the expansion handle or by using appropriate method on the tree application events handlers. Ability to load node level data only when needed. Tree supports level by level loading by using template level associated submit action. 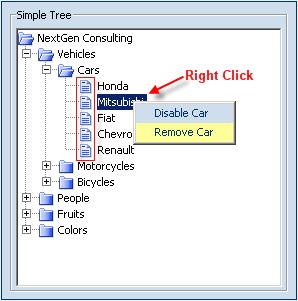 A popup menu which is attached to a tree node. It is triggered by right click on the relevant node. 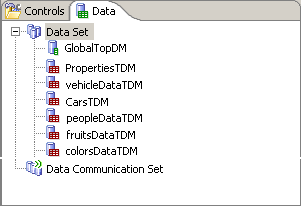 The Tree control allows customizing different contextual menus for different node types. Both tree expanding and tree collapsing can be voided by cancelling the respective event. In order to illustrate the implementation, let’s use the following Topics logical data model structure. 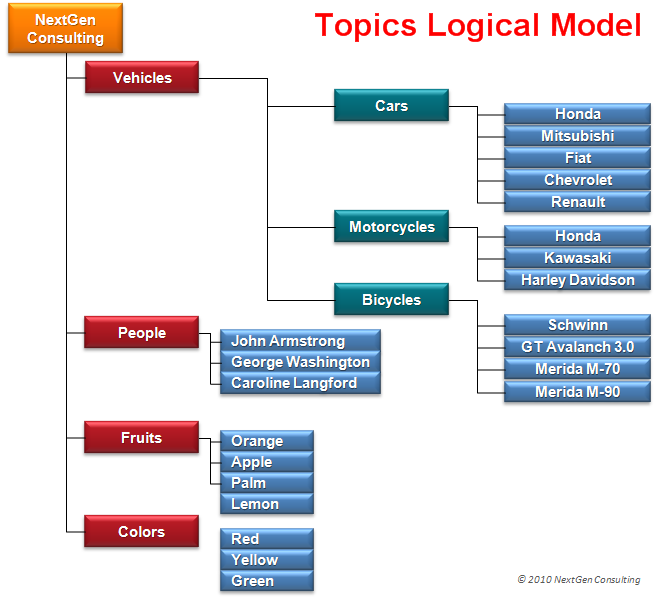 The Topic logical data model is build of a simple hierarchical data as illustrated in the picture above. First we need to create smart client data models and relate them to create the hierarchy. 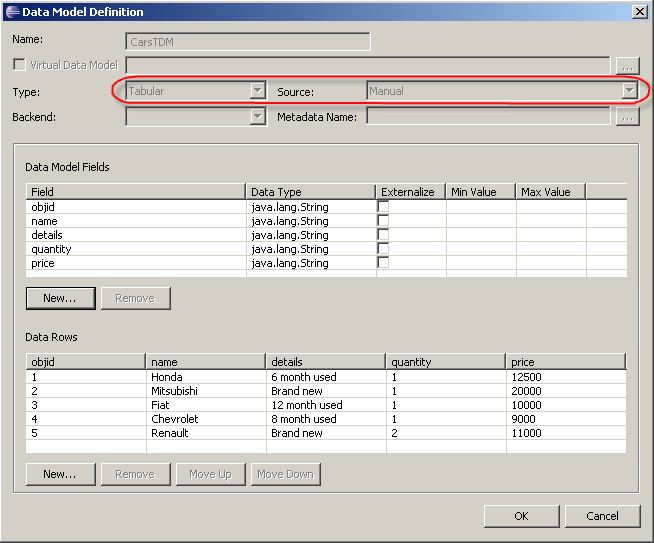 We now create the data models in the Smart Client designer. 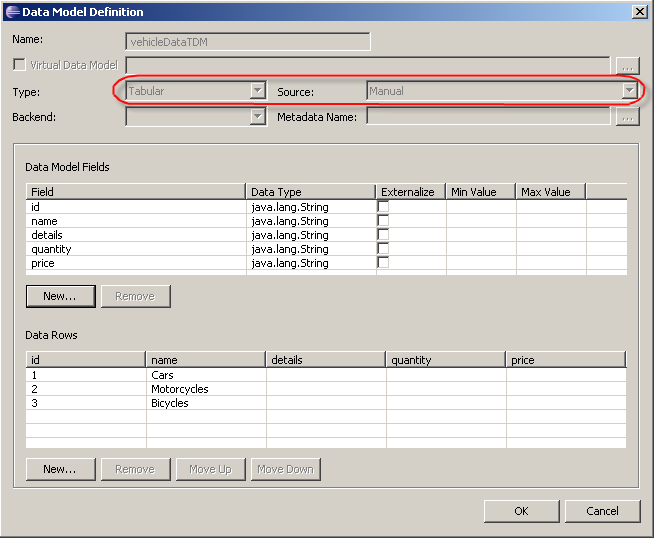 For simplicity we define our data models manually and set their fields values at design time. 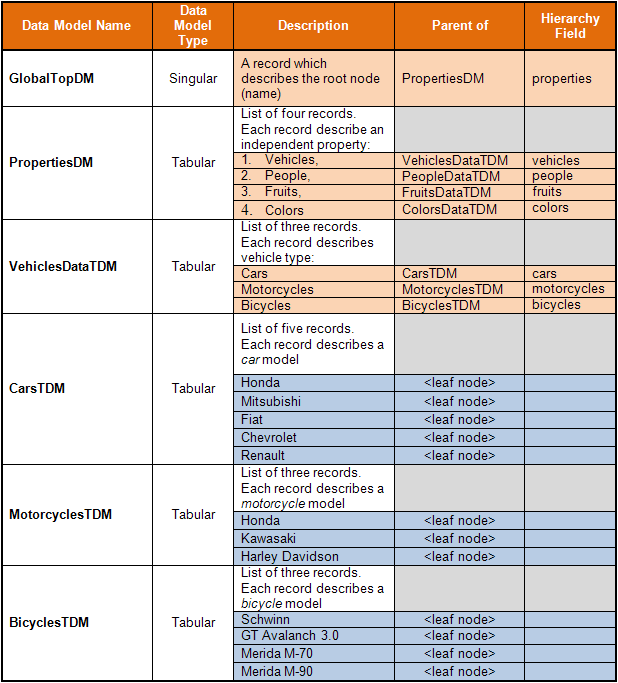 The top data model is a single record; all other data models are defined as tabular or set of records. 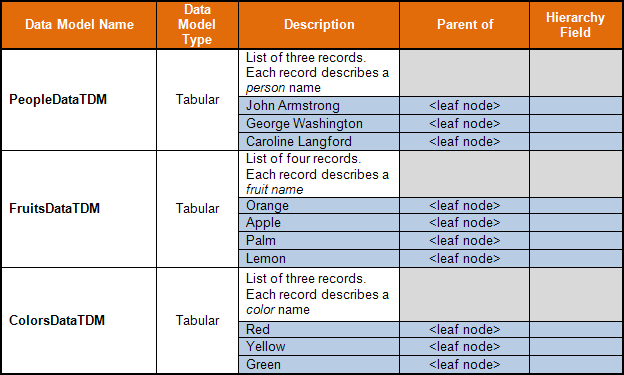 Tabular set of records can be used either as container nodes (parents of other related set of records) or as leaf nodes (those which do not have children). For simplicity we shall provide all names at design time as per our above design (see data models definition pictures bellow). 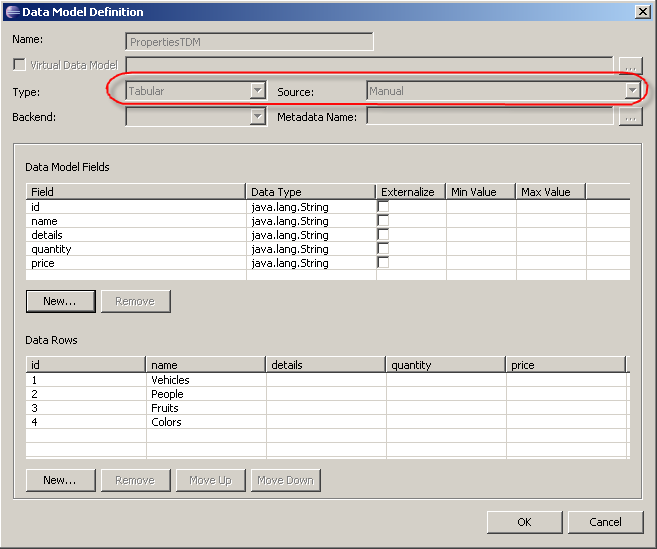 Note that the designer allows creating data models, but as of release 7.5.2 it still does not support hierarchical visual definition. We shall create the model hierarchy programmatically in the next section using a third field called ‘properties’, ‘vehicles’, ‘people’, ‘fruits’, ‘colors’, ‘cars’, ‘motorcycles’, ‘bicycles’. The following picture show these fields in a dashed bordered white boxes (‘properties’, ‘vehicles’, ‘people’, ‘fruits’, ‘colors’, ‘cars’, ‘motorcycles’, ‘bicycles’). The hierarchy field (we name it arbitrarily for each hierarchy level) is created dynamically at run time while the hierarchy is being defined. 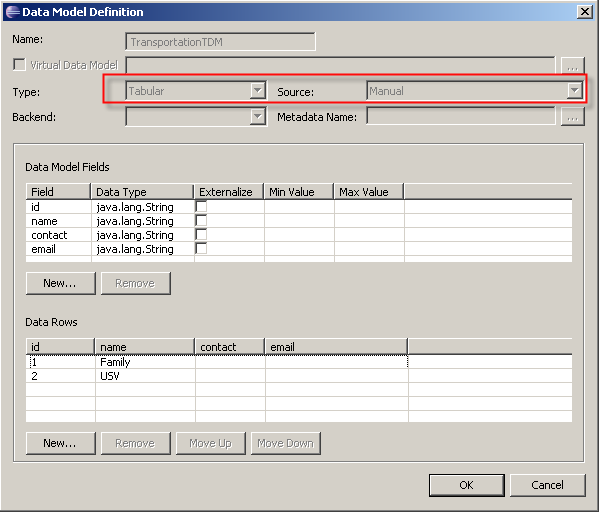 The form_Load event is used for creating the model hierarchy. 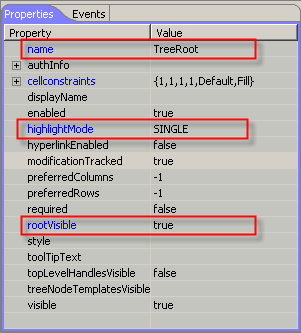 Note that when installing the Tree control, root template and context menu are automatically installed as well. 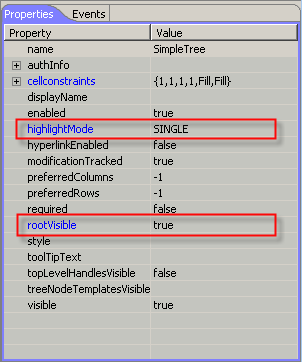 highlightMode – Set to SINGLE to allow only single node to be selected at a time. rootVisible – Set to ‘Yes’. This will make the root node visible. 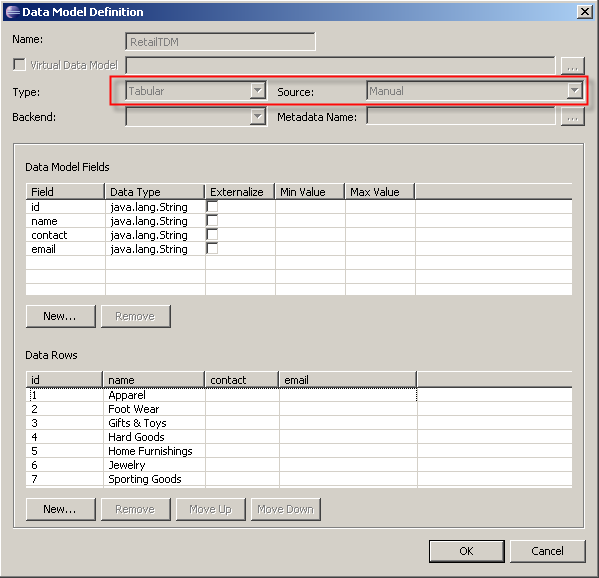 dataModelMap – single (none-tabular) record data model attached to the Root node. closeIcon, leafIcon and openIcon properties set the path to each of these states. <leave empty> the data model is the root data model map (see above). Data model map field bound to data model map. The field contents will be displayed alongside the root. Set the node action when it is double clicked. This action can be shared by several nodes. It can identify the double clicked node name and perform unique activities relevant to specific nodes (see the code bellow). For each level below the root node, we add a node template. 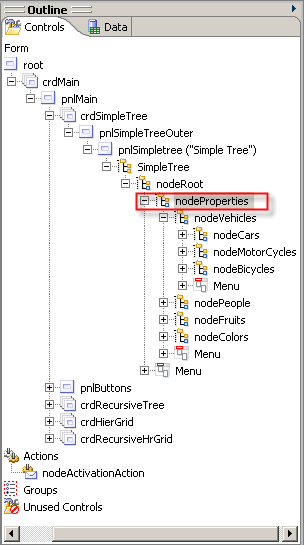 The node template properties contain control properties. 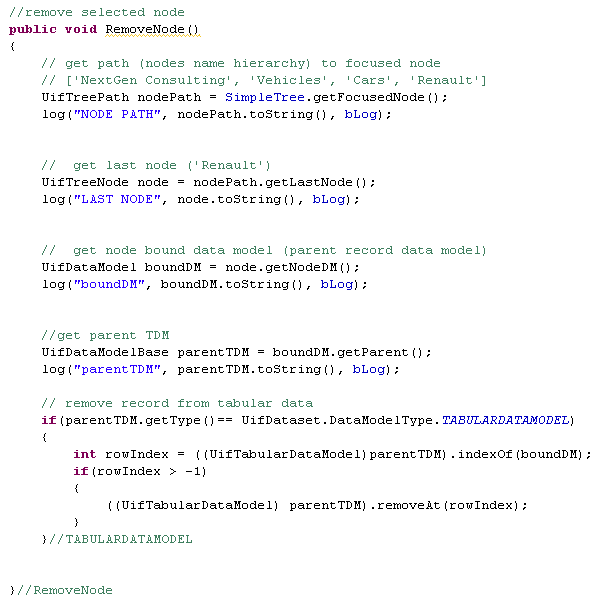 The dataModePath (marked in blue) property is set to the hierarchy field path between this node template (nodeProperties) data model and its parent data model. Hierarchy field path: properties (set programmatically by form_Load event). We bind the text control to the field ‘name’ at PropertiesTDM. We do not need to explicitly set the binding data model, since it is implicitly derived from the dataModelPath. We also set the controls’ state icons (openIcon, leafIcon, closeIcon etc) and set our common activationAction to ‘nodeActivationAction’ as we set in the parent nodeRoot template. Next we add, in a similar way, the second and third level templates of our model hierarchy. Note that the activationAction remains empty. This will prevent any response to a ‘double click’ on any of the nodePeople (rendering PeopleTDM) leaf entries. 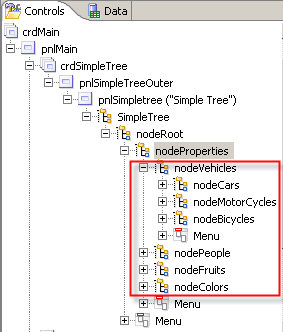 Now, after we managed to view the full data model displayed in our SimpleTree control, it’s time to provide additional functionality that will allow accessing the selected (highlighted) node information. 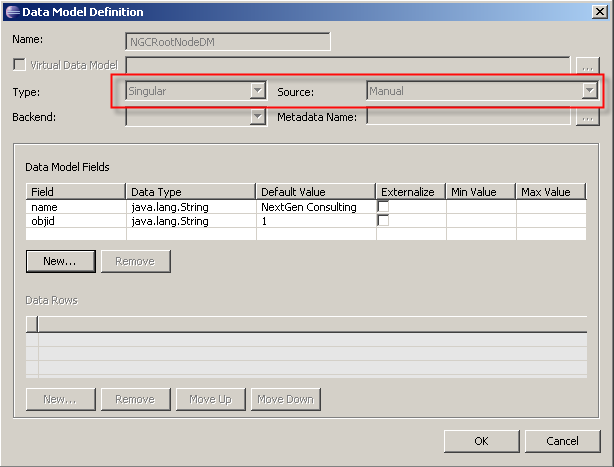 The following expression provides a simple way to access the last selected node. 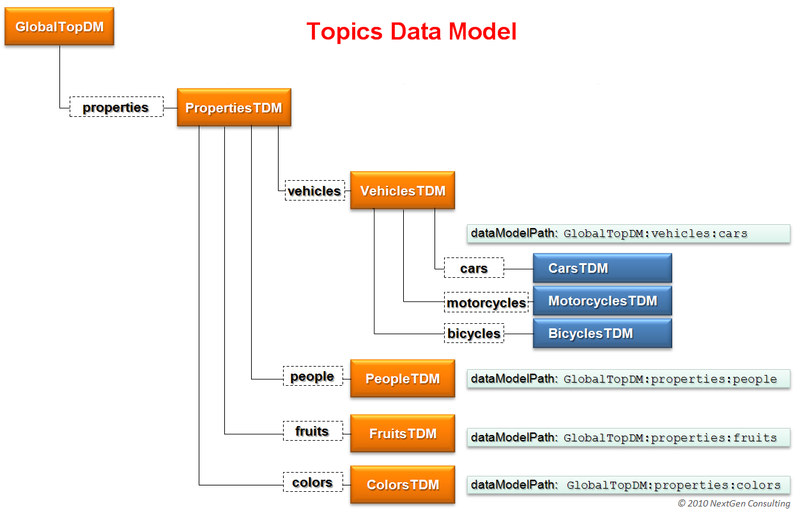 The Topics model we used in this example use static nodes; the records contained in the data models are set at design time. 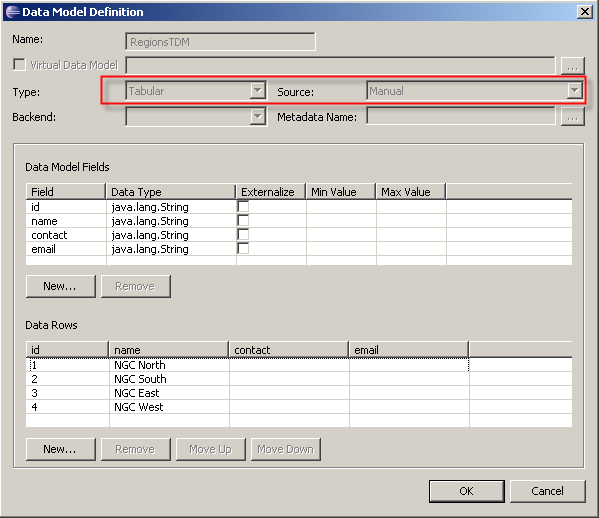 Real life scenarios often require the ability to change data models contents at run-time; it may require adding or removing either leaf or container nodes. 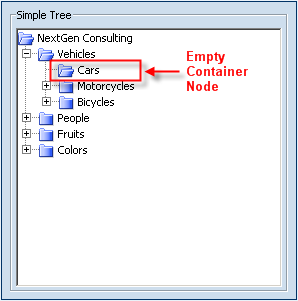 Right clicking on the Cars container node will allow adding a child leaf underneath the container node. 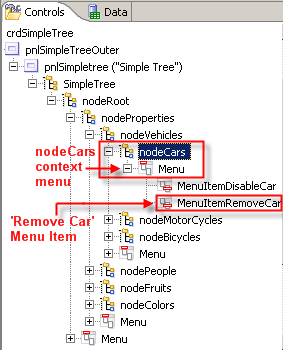 Right clicking on any of the cars leaf nodes will allow to remove the selected leaf node. By now you probably have noticed that while adding a Tree control, it automatically installs a root node template and a menu attached to it. Similarly, a menu it attached to each additional new level node template. 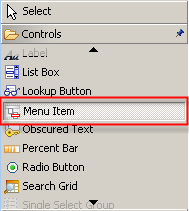 These menus are inactive as long as they do not contain any menu items. 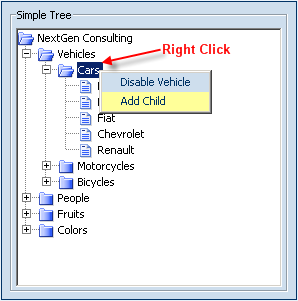 Adding a menu item to a tree level menu will allow displaying this menu item within a contextual menu when right clicking the relevant node children. 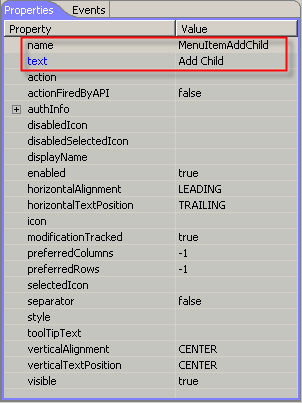 Note: a level node contextual menu will be activated on its children. As already mentioned above, any context menu which we would like to be displayed when right clicking on a node (container or leaf), should be installed on the node’s parent node. Thus, the menu will be shared by all nodes at the same level. 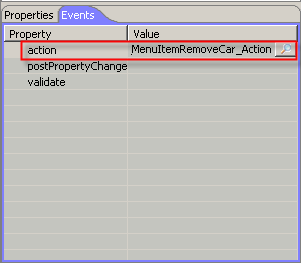 We would like to have the first menu displayed when right clicking on the Cars container node. Therefore we shall install the ‘AddChild’ menu item on the Cars’ parent node Vehicles. Naturally, this menu will also be available on the other two nodes sharing the same level: Motorcycles and Bicycles. Later we can programmatically take care for any different behavior required for the other two nodes. 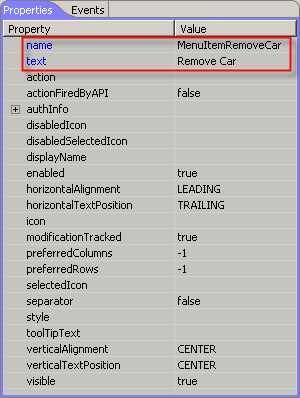 Note that the text property is static and will be displayed ‘as is’ on all level nodes (Cars, Motorcycles, Bicycles). We can easily bind the text property to the underlying data model (boundDM) to reflect the node which was right clicked. 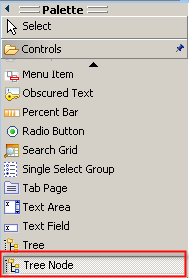 Merely displaying these context menus is not enough. We need to set an action handler to perform the required task. We set the ‘action’ event to the event handler to perform the task. The AddChild() method will handle the actual task. The AddChild() method is discussed bellow. The second menu will be displayed when any car leaf node is right clicked. The ‘RemoveCar’ menu item will be installed on the container node Cars. This menu will be shared by all the children of the Cars node. Smart Client development convention follows the MVC (model view controller) paradigm. It recommends avoiding direct manipulation of UI controls. It is always recommended to perform any necessary changes in the UI bound data model. This recommendation applies to tree nodes as well. 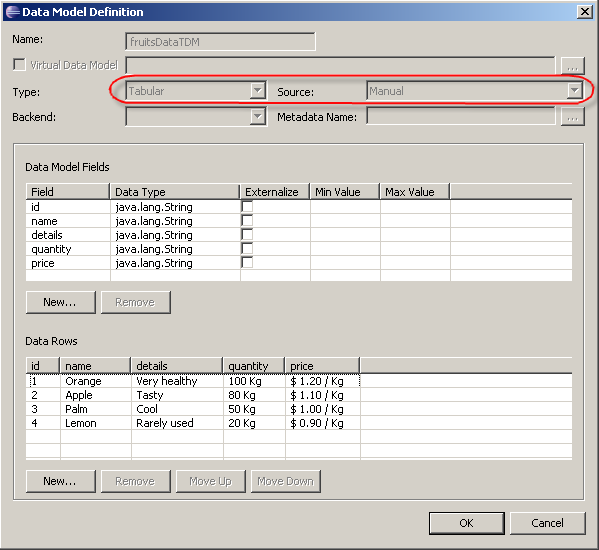 Therefore, our goal is simply identify the tabular data model (record list) that models the leaf nodes to which we would like to add an entry. 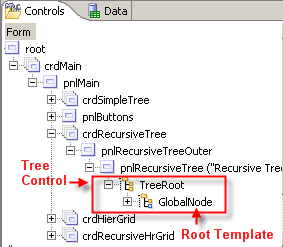 Identify the selected tree node (retrieving the path to it and use the path to identify current tree node). Identify node’s template and its dataModelPath. 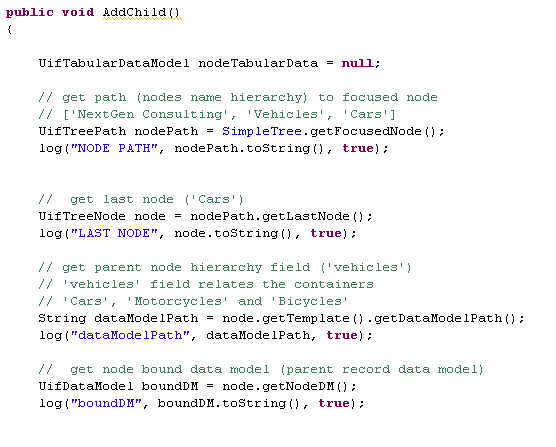 The template’s dataModelPath defines the hierarchy field in the node’s parent data model (usually this is a record in a list of records defined in parent tabular data model). Access the node’s bound data model needed later. 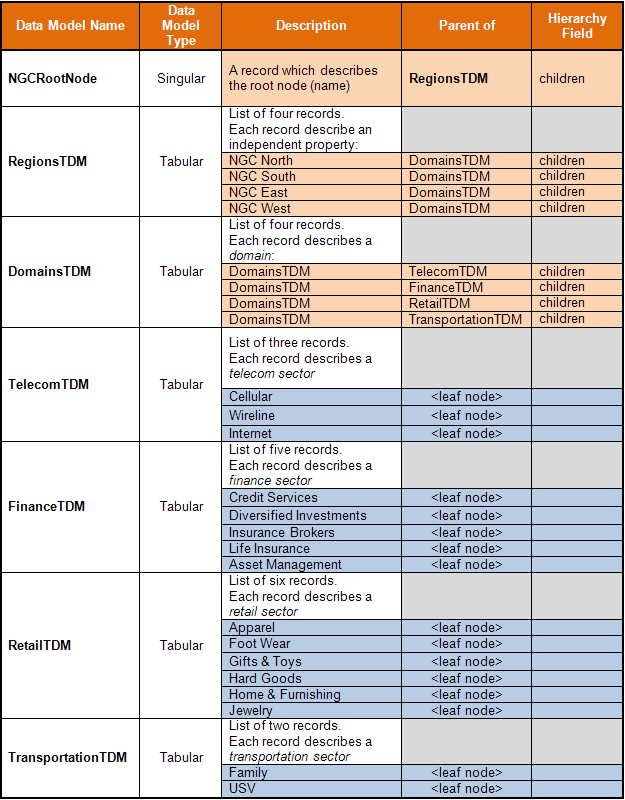 Get reference to the node’s children TDM (tabular data mode). 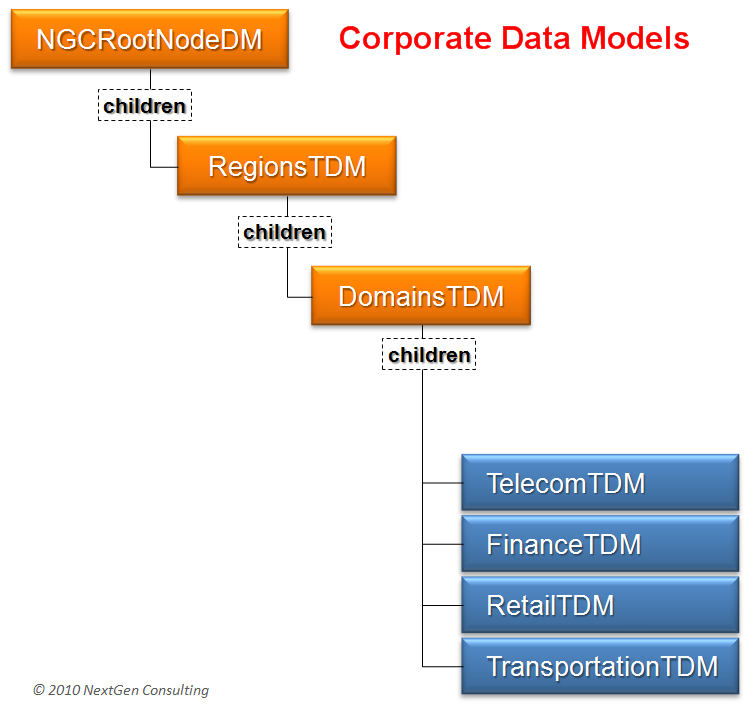 Identifying the children TDM is done via the node’s bound data model hierarchy field. This field contains a reference to the children’s tabular data model (TDM to which we shall later add a new record). 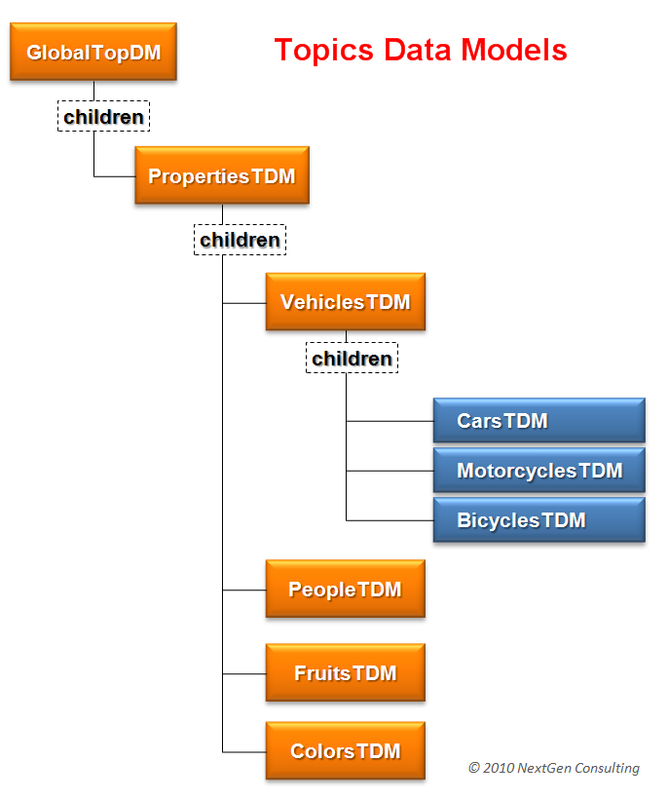 Usually we can find this hierarchy field easily via any of the children’s dataModelPath. Unfortunately the above method does not always work for us. It fails to provide an access to the bound data model Hierarchy field and related TDM in case the selected node is a container node (i.e. a node that is supposed to have children) but has no children yet (this might happen if all children where previously removed; there is still an empty Tabular Data Model to which we need to add a child’s record (data model row). To address the ‘empty container node’ scenario, we need to explicitly search the for the children hierarchical field in the bound data model. We call the getHierarchyField() method (see third code segment) to perform this search for us. The third AddChild() code segment performs the actual child addition. 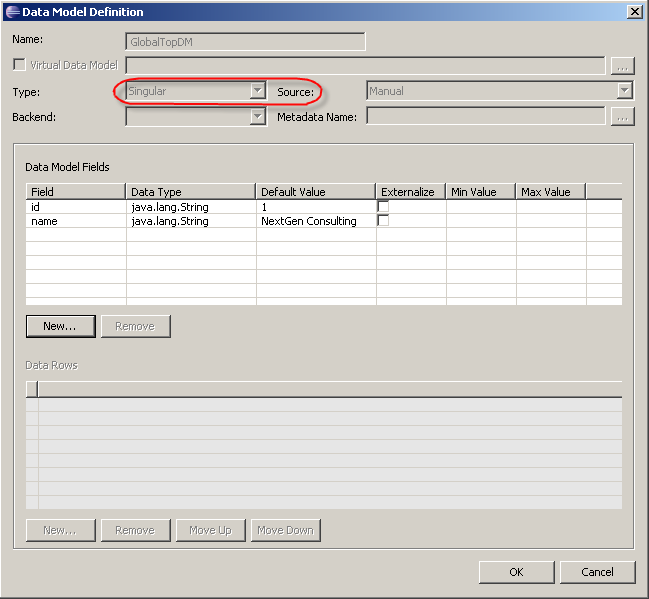 Finally it adds the newly created data model record to the children’s tabular data model. Once added, the tree control display will be automatically refreshed and a new child leaf node will be displayed. 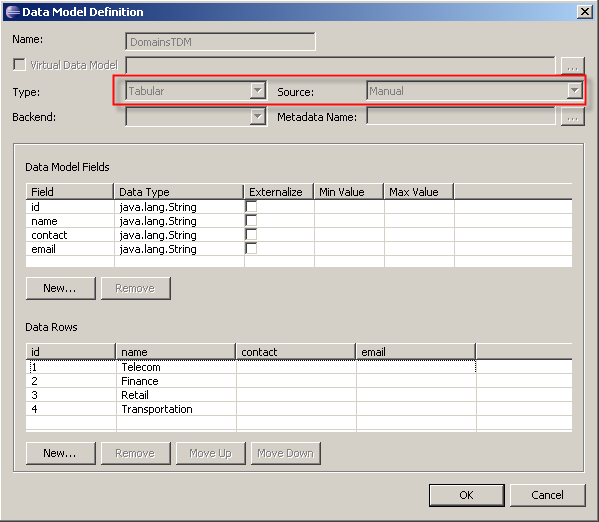 Identify node bound data model boundDM (elaborated above in AddChild() code example). 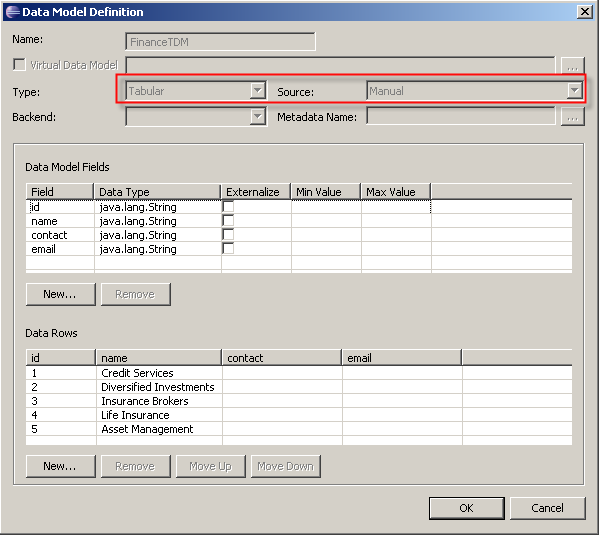 Identify parent tabular data model. 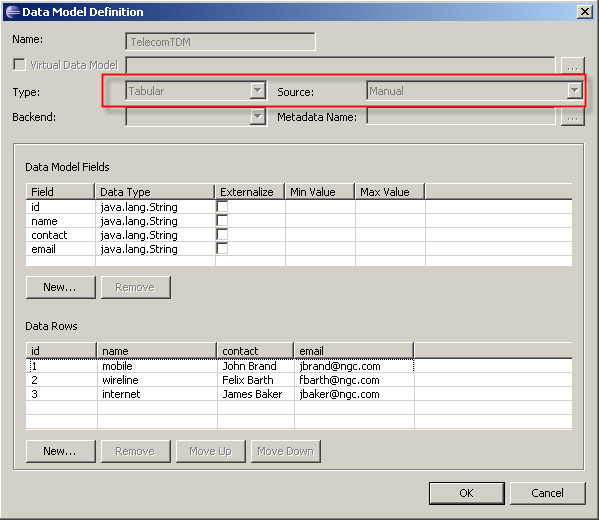 Remove the bound data model (record) from its container (the parent TDM). In the first part of this discussion we described a simple tree. The tree structure is static; its structure is defined at design time and cannot be later changed. Quite often there is a need to address business scenarios that require supporting a dynamic tree which may contain any number of nodes, to any level or structure. Recursive template provides the mechanism to use a single template definition with many nodes in any tree structure as needed. Thus, the tree structure can be dynamically changed at run time by modifying the data model programmatically. The following organizational tree structure illustrates an organizational tree. 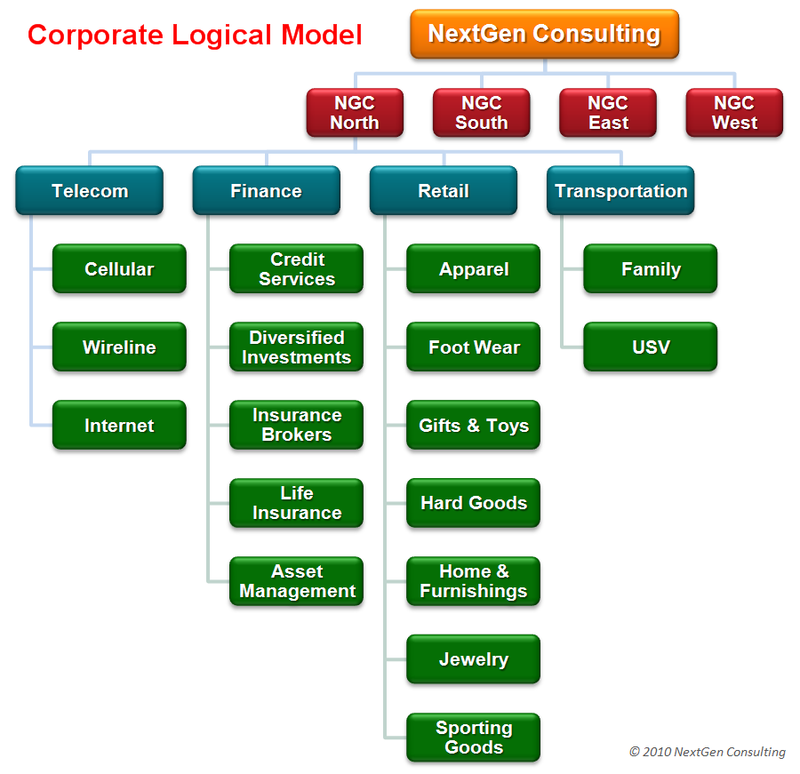 ‘NextGen Consulting’ has four regions; each has its own similar sub-tree structure. 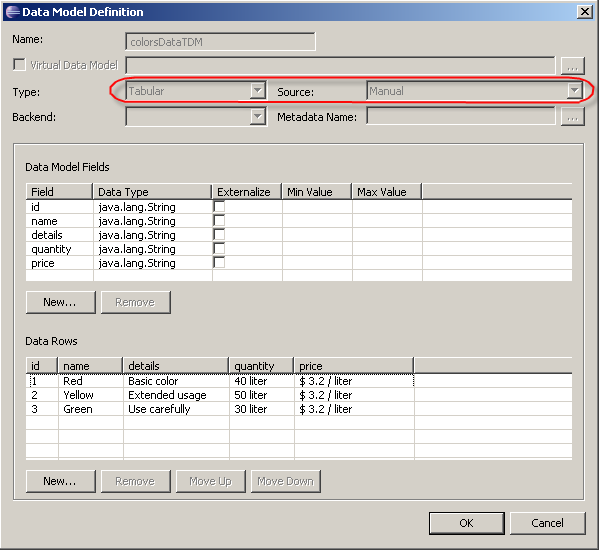 Note that the designer allows creating data models, but as of release 7.5.2 it still does not support hierarchical visual definition. We shall create the model hierarchy programmatically in the next section using a third field called ‘children’. 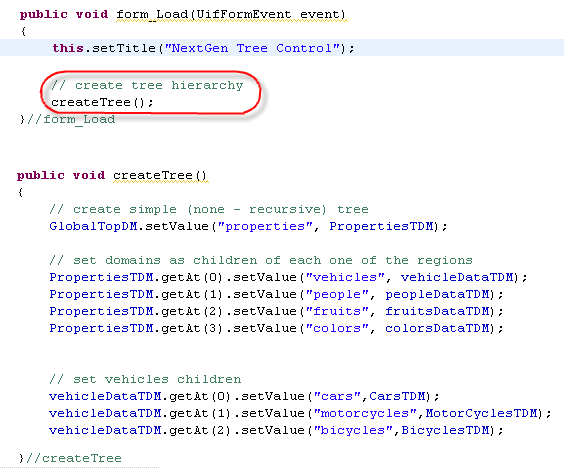 As in the SimpleTree example, we shall use the Form_Load event to create the data models hierarchy. Note: We could have also create and populate the data models programmatically, but preferred to accomplish this task in the Smart Client designer for simplicity. 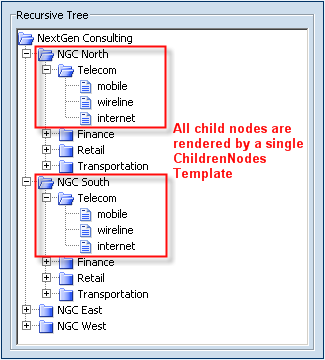 The ChildrenNodes Template will be used by ALL tree control child nodes. 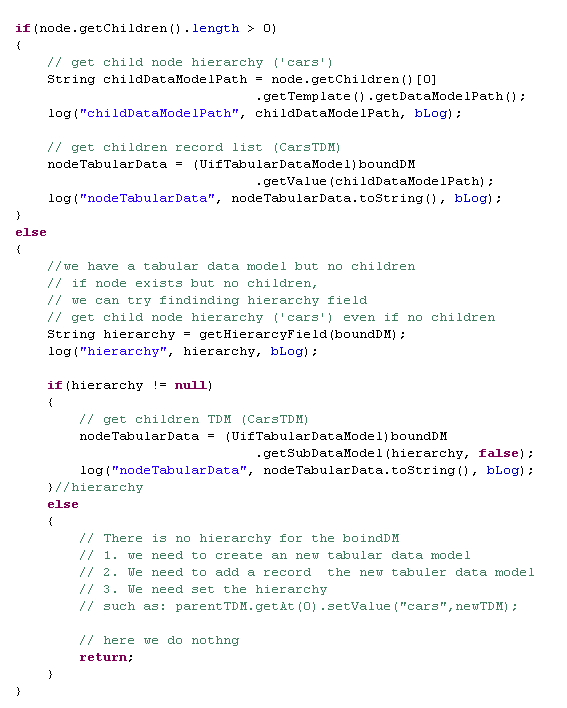 Therefore the dataModelPath property is ‘children’. 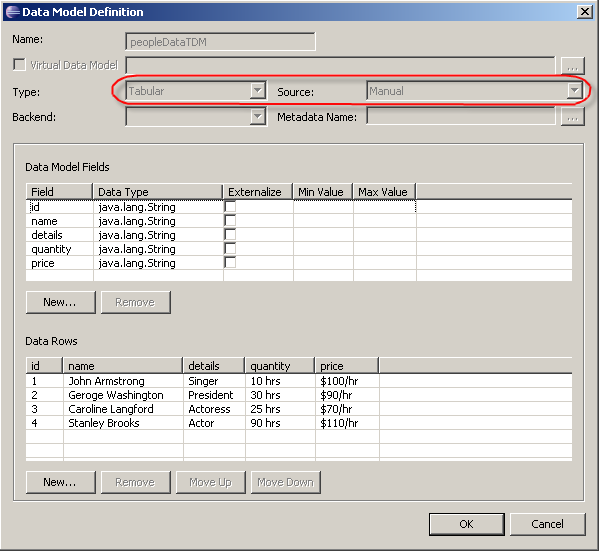 This hierarchy field is used by all data models. Its value references their respective children. The recursiveTemplteName property is set to root template ‘GlobalNode’. It means that ChildNodes template should act as a place holder for a runtime proxy that refers to the recursive template. That is the end of this discussion. In the next part of this article we shall try to implement the concepts covered so far to create Hierarchical Grid and Hierarchical Search Grid. Thanks for the info, very inspiring piece! 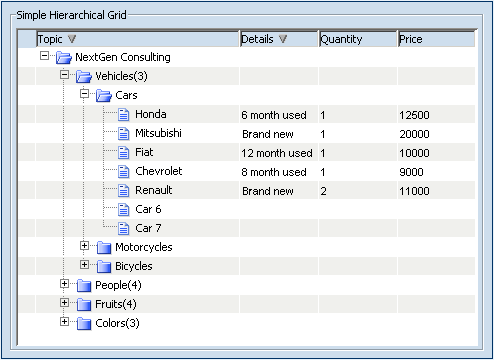 I’m really looking forward seeing the Hierarchical Grid and Hierarchical Search Grid. examples… thx yuval!! Use the examples above. I hope it will help you in your implementation. Thanks for one’s marvelous posting! I certainly enjoyed reading it, you are a great author.I will be sure to bookmark your blog and will often come back later on. I want to encourage you to definitely continue your great posts, have a nice evening! What’s Happening i’m new to this, I stumbled upon this I’ve found It absolutely helpful and it has helped me out loads. I’m hoping to contribute & assist other customers like its helped me. Great job.